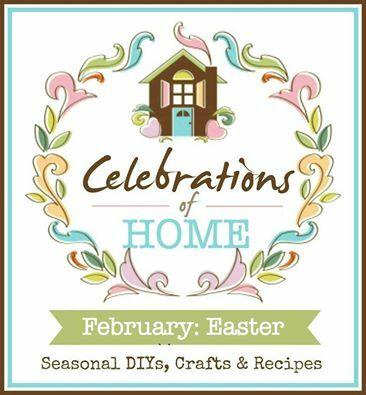 I'm excited to join a group of very talented bloggers for the monthly share from Celebrations of Home and this time our topic is Easter! For me, nothing says Easter and spring more than eggs! 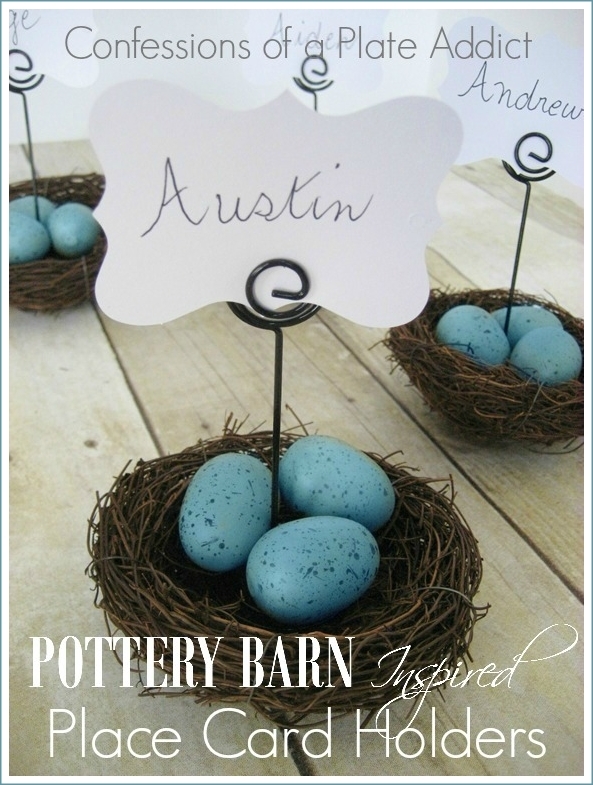 I have a special fondness for bluebird eggs so I fell in love when I saw Pottery Barn's Nest Place Card Holder and knew I had found my next project! And....I knew this one was going to be almost free since I already had most of what I needed in my stash! All I had to buy was the wire place card holders...and they were on sale half-off, so I spent a total of $3.50 to create 4 of them! Woo hoo! You could even buy all of the supplies that you need for about $10 with coupons and still beat their $26 price tag. Using a bit of wire, attach the card holder to the nest to keep it steady. Add the eggs. You can hot glue them if you wish. Add a name card and you are done! That is it! And it only took about five minutes to make all four! Here's a closer look. Aren't they cute? And $3.50 beats $26 any day! 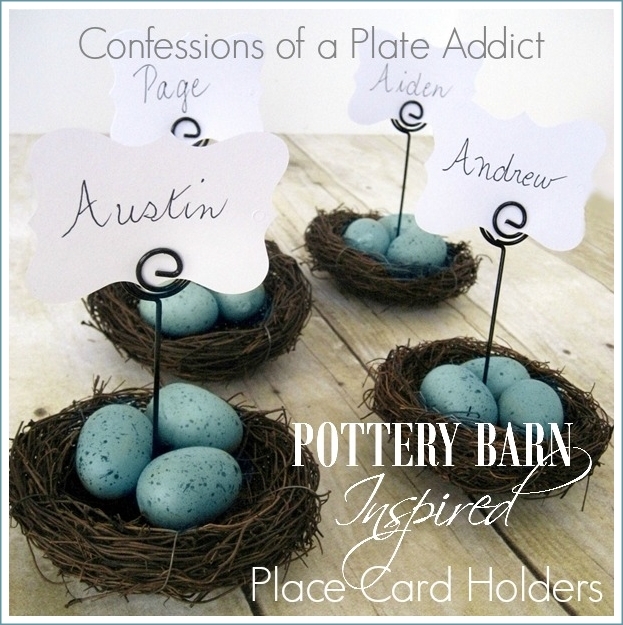 ...I am going to enjoy adding these to my spring tablescapes, too! 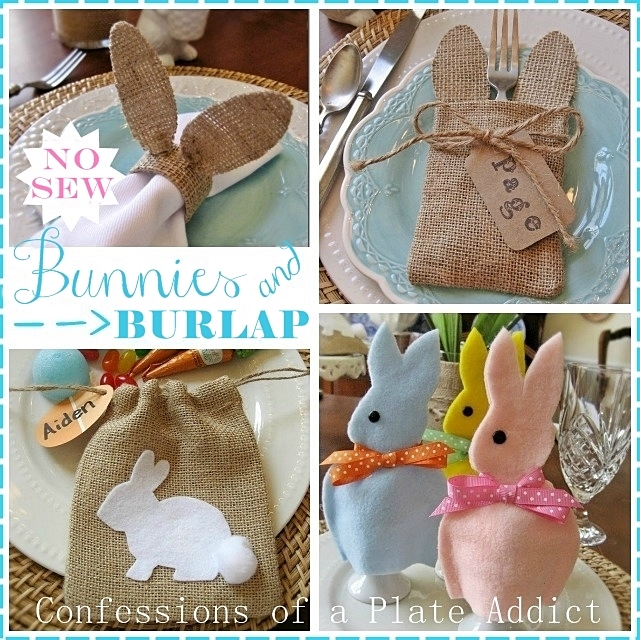 And just in case you are looking for some more ideas that will take you through Easter and all of spring, check out my No-Sew Bunnies and Burlap for Spring! You will find lots of easy ideas that won't require you to sew a stitch! And be sure to check out the wonderful creations of my talented fellow bloggers to get your Easter season off to a fun start! Very cute ... And a fabulous bargain! Cute idea, Debbie! And of course, I always love seeing your feline assistants! What a super cute and thrifty idea. I hope you will come share it at Show and Share on Monday. love it when I see Pottery Barn knockoffs for so much less. I love PB, but they are really getting too high-dollar with their products. They are so adorable, budget-friendly and looks very pretty! Thanks for the inspiration! Debbie, these are perfect! I love the PB look without the $$$ Love them! Debbie those are darling! Pinning! You've knocked it out of the park once again - these are just adorable! Love the look without the price! I love these!! They will go so well with my bird-nest-with-eggs napkin rings for a very spring-y, bird-y tablescape. Thanks so much for sharing--you always have such great ideas! Love, love, love this idea! I need to check out that wedding aisle at Hobby Lobby! your place cards are too cute.